Episcopal Community Services of San Francisco (ECS) and Mercy Housing have been selected to build and run San Francisco’s largest supportive housing development for formerly homeless people. The two-building development to be built near 7th and Mission will provide permanent homes for up to 265 households experiencing chronic homelessness, with 100 of these new units earmarked for formerly homeless seniors, age 62 or older. 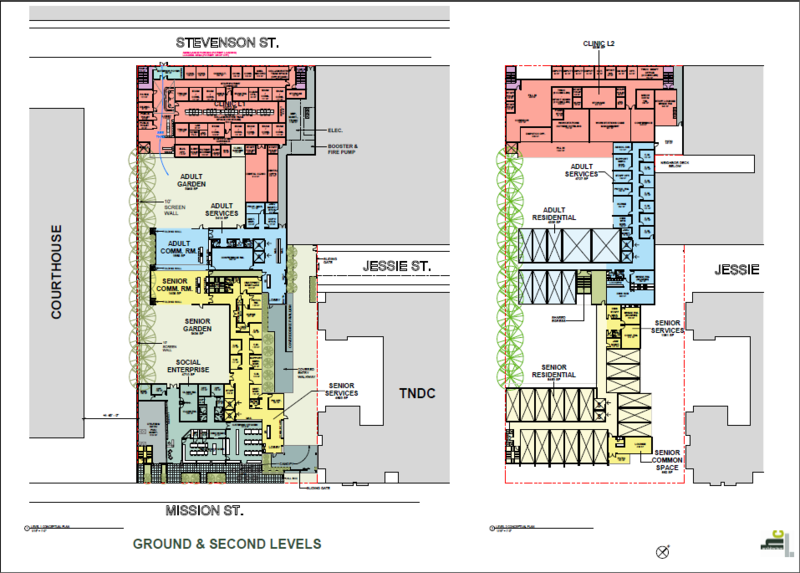 The City of San Francisco’s selection panel recommended the ECS/Mercy team to exclusively negotiate a ground lease for the site near 7th and Mission, based on a detailed proposal submitted in response to a competitive Request for Qualifications. ECS, in partnership with Mercy Housing, has been selected to develop San Francisco’s largest-ever supportive housing development for formerly homeless people. The 7th and Mission site will be the location of a new supportive rental housing development for formerly homeless adults and seniors (age 62 years +). The approximately 260 studio apartments will be comprised in two buildings located on the current parking lot located at 1064-68 Mission Street in San Francisco. The site is adjacent to the James R. Browning Court House and is on land that is being provided by the Federal Government which has stipulated that the site be used exclusively for supportive housing and services addressing the needs of formerly homeless persons. The Mayor’s Office of Housing and Community Development (MOHCD) selection panel recommended the ECS/Mercy team to exclusively negotiate a ground lease for the site based on a detailed proposal submitted in response to a competitive Request for Qualifications. The housing element of the development will be fully covered by public funding services, a bond backed construction loan and tax credit equity. The total projected construction cost is $143 million. Construction is set to begin in June 2020 with a 100% occupancy goal in spring of 2022. The development will be a national model, bringing together multiple best-practice elements to help San Francisco’s most vulnerable, chronically homeless neighbors achieve housing stability, improve health outcomes, and lead stronger, more independent lives. In addition to housing and on-site case management, this community will be the new permanent home for the Department of Public Health’s (DPH) Tom Waddell Urgent Care Clinic, which includes dental services and a specialized Street Medicine program. The City’s Department of Homelessness and Supportive Housing’s (HSH) Homeless Outreach Team will also be headquartered here. With prime Mission Street frontage and over 5,000 square feet of ground floor commercial space, the new 7th & Mission development will also be the spectacular new site of ECS’s CHEFS workforce development program and an affiliated foodservice social enterprise. Since its founding, over 1,000 formerly homeless and very low income students have participated in the CHEFS program: A free, five-month training program that provides instruction in the technical and professional culinary skills in high demand in San Francisco’s booming food service industry. Combining classroom instruction, case management, in-kitchen hands-on training, and internships at local restaurants or institutional kitchens, CHEFS changes lives. Students with a prior experience of homelessness develop the skills and the confidence to gain and sustain employment, improve their financial stability, and make homelessness a thing of the past. The planned build-out of the CHEFS training facility, social enterprise, and café area is estimated to cost approximately $4.2 million. At the new site, CHEFS will finally have its own purpose-built, state-of-the-art training center with a dedicated teaching kitchen, abundant institutional food storage, classroom space, and offices for instructors, case managers, and vocational specialists – a place to inspire pride, build dreams, and find support. A robust revenue-generating culinary social enterprise will be co-located within the space, offering CHEFS students a period of transitional employment in catering or commercial meal preparation, deepening their workplace readiness in a supervised setting. Some commercial frontage has been designated for a café or retail space, offering high quality, nutritious prepared meals for sale to the neighborhood. ECS is working hand in hand with the community as we develop the 7th & Mission project. We have consulted with the adjacent U.S. 9th Circuit Court of Appeals, convened alongside enthusiastic groups of our future neighbors along Stevenson Street, consulted with the Central SOMA Community Benefit District, and SOMA Filipinos, as well as seeking input and ideas from both neighboring large tech businesses and condo dwellers. ECS and Mercy Housing have also created the 1064 Mission Advisory Committee, particular to this development, which includes individuals from community-specific groups who meet monthly to discuss project details and progress as a collective. The project includes a long stretch of community open space, thoughtfully designed streetscapes, landscaped interior courtyards for residents, and culturally-specific public art from local community artists and organizations. IN NEED OF HELP TODAY? If you have been assessed by Coordinated Entry for Housing and have questions about your status?